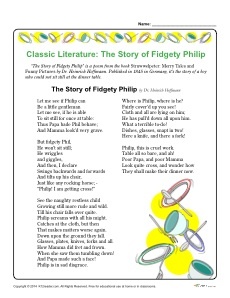 “The Story of Fidgety Philip” is a poem from the book Struwwelpeter: Merry Tales and Funny Pictures by Dr. Heinrich Hoffmann. Published in 1845 in Germany, it’s the story of a boy who could not sit still at the dinner table. In this worksheet series, students read the poem and complete the accompanying worksheets. Activities include comprehension questions, vocabulary, homonymns, and more.